Winning a war or revolution, only to lose the subsequent peace, is one of the grim political truths of our time, says Prime Minister Ranil Wickremasinghe. “In Iraq, a quick military victory over Saddam Hussein’s regime soon gave way to insurgency, civil war, and the rise of the murderous Islamic State. In Libya, Syria, Yemen, and elsewhere, the hopes unleashed by the Arab Spring have similarly turned into an often-violent despair,” he said. Mr Wickremasinghe stated that today, a half-decade after the end of the 36-year civil war, Sri Lanka is at a crucial moment in its own efforts to consolidate peace and secure its long-term benefits. “Newly elected President Maithripala Sirisena and I, as prime minister, are determined to win that peace, and to help our country become what it always should have been: a prosperous Asian island of democracy, civility, and open society,” he wrote in an opinion article published on Project Syndicate. He stated that the risks of a failed peace are appearing only now, because, since 2009, when the war with the Tamil Tigers ended in an enormous spasm of violence, the government led by former President Mahinda Rajapaksa made only the most half-hearted of efforts to bring about reconciliation with Tamil citizens. “That neglect was part of a deliberate strategy by Rajapaksa, who saw keeping Sri Lanka on a semi-war footing, and our Tamil citizens aggrieved and alienated, as the most effective way to maintain his iron-fisted rule,” he charged. But, though his divide and rule strategy worked for a while, allowing him to concentrate an unprecedented amount of power in his own hands, it could not hide the truth of our social divisions and continuing impoverishment, Mr Wickremasinghe wrote. The prime minster said that in the months since Sirisena’s triumph, Sri Lankan democracy has been revived, and the hard work of building a durable domestic peace has begun. “Moreover, presidential power is now exercised within the limits established by law, not according to the whims of one man. Our judges no longer feel intimidated. Our business leaders no longer fear shakedowns and takeovers by the president’s greedy family members and cronies,” he said. “Of course, some of our neighbors are advising us to take a different path, to reform our economy and not worry too much about re-establishing political freedom,” he said. He stated that the country’s experience with authoritarian rule, however, is that it undermines the goal of post-conflict reconciliation and reconstruction by its need to maintain society’s divisions artificially. He pointed out that the best way to avoid a relapse into conflict and arbitrary rule is to ensure that Sri Lanka’s leaders are held accountable through representative institutions. “Too much of our country’s wealth has been damaged by war, taken flight abroad, or been siphoned off through corruption. We simply lack the resources to undertake the great task of reconstruction without assistance,” he said. “So we need the world’s democracies to stand with us and support us, lest our people become discouraged and be tempted by the autocratic forces waiting in the wings to return to power in the coming parliamentary election,” he said, adding, that sadly, the help that Sri Lanka have received so far is too little to enable the government to be as effective as it can and should be in rebuilding the country and resetting its strategic position in the world. Winning a war or revolution, only to lose the subsequent peace, is one of the grim political truths of our time. In Iraq, a quick military victory over Saddam Hussein’s regime soon gave way to insurgency, civil war, and the rise of the murderous Islamic State. In Libya, Syria, Yemen, and elsewhere, the hopes unleashed by the Arab Spring have similarly turned into an often-violent despair. Today, a half-decade after the end of its 36-year civil war, Sri Lanka is at a crucial moment in its own efforts to consolidate peace and secure its long-term benefits. Newly elected President Maithripala Sirisena and I, as prime minister, are determined to win that peace, and to help our country become what it always should have been: a prosperous Asian island of democracy, civility, and open society. The risks of a failed peace are appearing only now, because, since 2009, when the war with the Tamil Tigers ended in an enormous spasm of violence, the government led by former President Mahinda Rajapaksa made only the most half-hearted of efforts to bring about reconciliation with our Tamil citizens. Reconstruction of war-ravaged Tamil districts, as well as other parts of our society damaged by years of fighting and terrorism, has barely begun. That neglect was part of a deliberate strategy by Rajapaksa, who saw keeping Sri Lanka on a semi-war footing, and our Tamil citizens aggrieved and alienated, as the most effective way to maintain his iron-fisted rule. But, though his divide and rule strategy worked for a while, allowing him to concentrate an unprecedented amount of power in his own hands, it could not hide the truth of our social divisions and continuing impoverishment. So, in the presidential election of this past January, Sirisena stunned the world by creating a winning coalition of Sri Lankans of all faiths and ethnicities who want to rebuild their democracy, not continue down the path of authoritarian rule. In the months since Sirisena’s triumph, Sri Lankan democracy has been revived, and the hard work of building a durable domestic peace has begun. We plan to quickly call a Parliamentary election, which will take place one year ahead of schedule, in order to replace Rajapaksa’s echo chamber with a fully functioning assembly, one that holds the government to account. Moreover, presidential power is now exercised within the limits established by law, not according to the whims of one man. Our judges no longer feel intimidated. Our business leaders no longer fear shakedowns and takeovers by the president’s greedy family members and cronies. As we liberate all of our citizens from fear, we will rebuild Sri Lanka as a free society. The authoritarian model of capitalism that Rajapaksa introduced to our country, and that much of the world seems to be embracing nowadays, is not for us. Of course, some of our neighbors are advising us to take a different path, to reform our economy and not worry too much about re-establishing political freedom. Our experience with authoritarian rule, however, is that it undermines the goal of post-conflict reconciliation and reconstruction by its need to maintain our society’s divisions artificially. The best way to avoid a relapse into conflict and arbitrary rule is to ensure that Sri Lanka’s leaders are held accountable through representative institutions. But we cannot fully turn the page on authoritarian rule, restore the full range of democratic freedoms, and rebuild our economy in an inclusive way on our own. Too much of our country’s wealth has been damaged by war, taken flight abroad, or been siphoned off through corruption. We simply lack the resources to undertake the great task of reconstruction without assistance. So we need the world’s democracies to stand with us and support us, lest our people become discouraged and be tempted by the autocratic forces waiting in the wings to return to power in the coming parliamentary election. We need to demonstrate to our people that reconciliation, democracy, tolerance, and the rule of law constitute the only route to long-term peace and shared prosperity. Sadly, the help that we have received so far is too little to enable my government to be as effective as it can and should be in rebuilding our country and resetting our strategic position in the world. Still, there is reason for hope. Though our political institutions need a thorough overhaul, I am proud to say that, despite Rajapaksa’s best efforts to corrupt and hollow them out, our victory was made possible because the election commission and court workers adhered to the law. Equally important, when the votes were counted, Sri Lanka’s military leaders honored their oaths and bravely rebuffed Rajapaksa’s unconstitutional order to annul the election and maintain him in power. These acts of civic heroism form a strong basis on which to refound Sri Lanka’s state and society. With the world’s help, we will do just that. I wonder whether this st**** man know the meaning of “Authoritarian rule”. 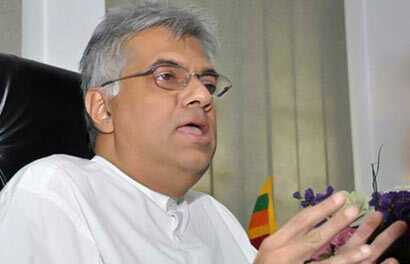 How come if the previous regime was “authoritarian” Ranil W lost so many elections during the last 10 years? How come MR lost an election if he was authoritarian? How do you get elections under authoritarian rule? If you are confused and don’t know what to say, better keep quiet. One can pretend to be wise only until he/she opens his/her mouth.